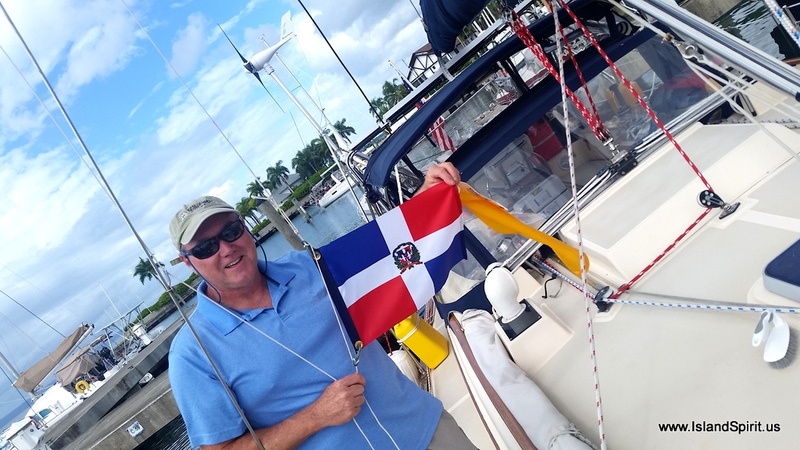 With a serious low pressure storm north of us, the normal east trade winds have been pulled to south flowing into this storm giving us a nice motor sail 150 nm from Dominican Republic to Puerto Rico where we planned to enter the USA at Puerto Real. 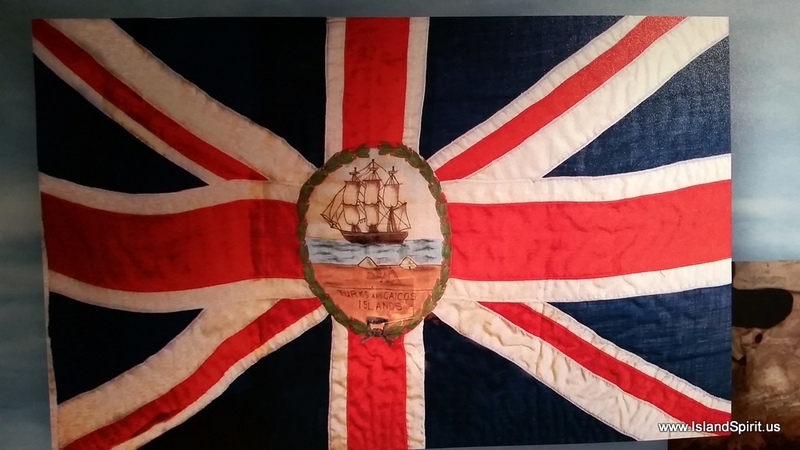 This crossing of the Mona Passage is well known in the cruising circles to be difficult and always rough, with confused seas and unpredictable currents. Lucky for us, this passage turned out to be relatively calm with a 5 foot swell of 9 seconds with a wind blown chop of 2-3 feet. 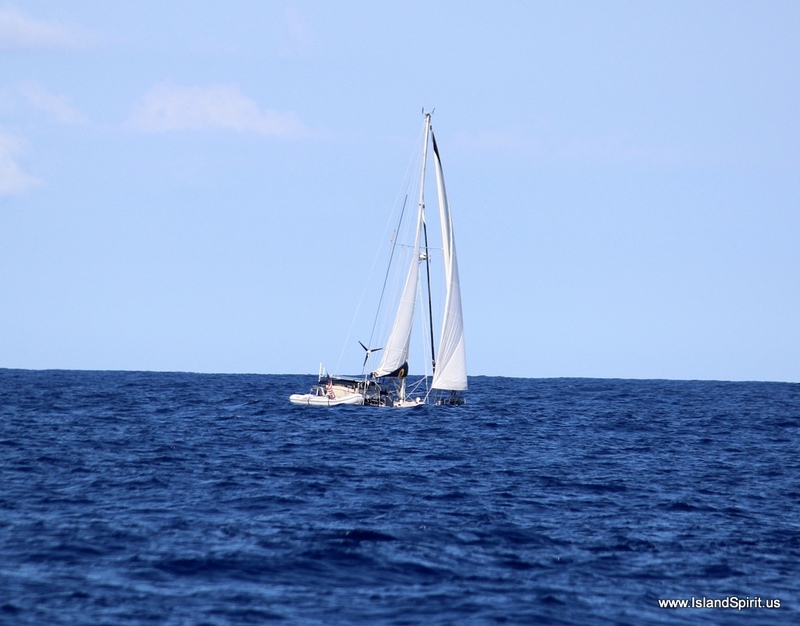 The beginning of the trip was flat calm with main and jib and 2500 rpms motor sailing at 7 knots out of Samana harbor and past the capes. 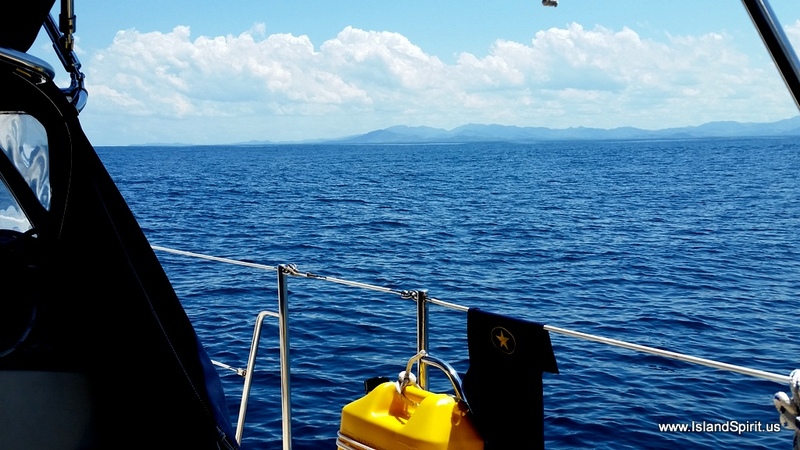 By midnight, we reached our point in the 1,000 to 2,000 meter waters well off the “hourglass shoals” which is known to have confused seas and crazy currents. We found the seas were a bit confused and the current was not too strong. We had a NE swell, and NW wind blown chop, and a S current, all making for a strange sea state. But overall, it was a relatively calm passage. 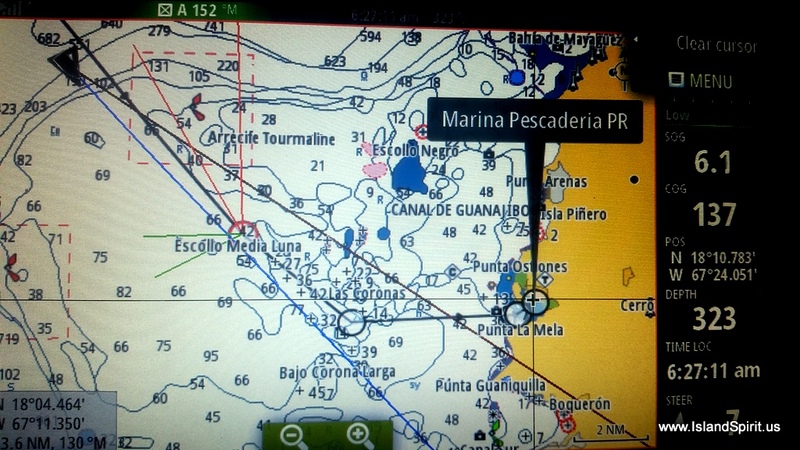 We then turned SE for the Puerto Rican coast, aiming for the SW corner where we could check into Puerto Real harbor. We had made reservations for all three boats at Marina Pescarderia in Puerto Real, where the the fee is $1.20/foot. This marina is in a fishing village and the people are extremely friendly and helpful, though most do not speak English. From here, we plan to make small, easy, short, early morning hops along the south shore of the Puerto Rican coast, discovering all the great towns and harbors this island has to offer. It is GREAT to back in the USA after sailing out of Florida on Super Bowl Sunday, Feb 5. Here are some photos of this passage and arrival. 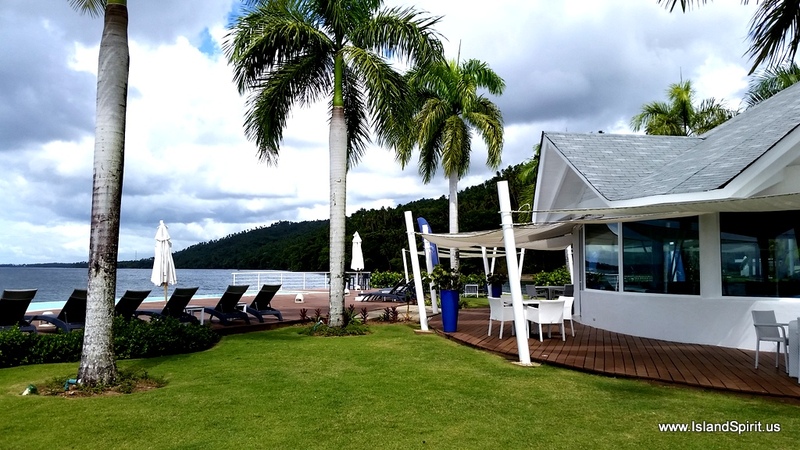 Our last days in Samana, Marina Bahia were filled with pool swims, movies and playing Mexican train. What a fantastic place to hang out, and all for $1/foot! Along the DR coastline there were many floating fish nets and traps! 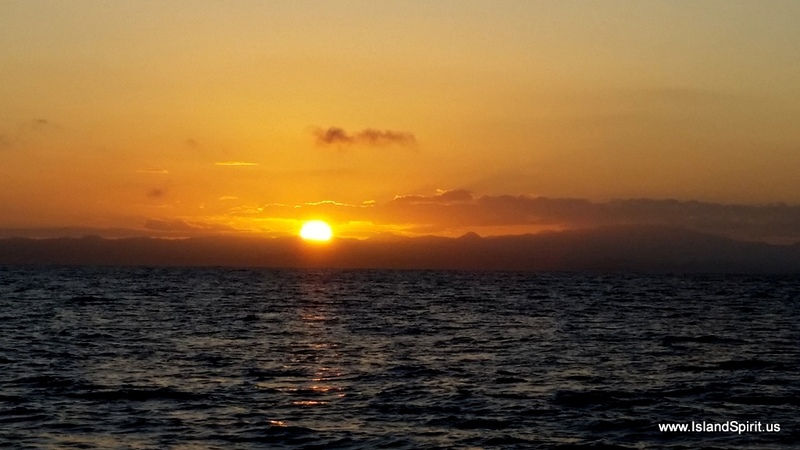 As the sun came up, after our overnite run, we were looking at the west coast of Puerto Rico, what a beautiful sunrise to great us as we motor sailed into the USA. We walked around town and of course had to find the local bakery where we bought FLAN for Radeen and ice cream for Hayden. 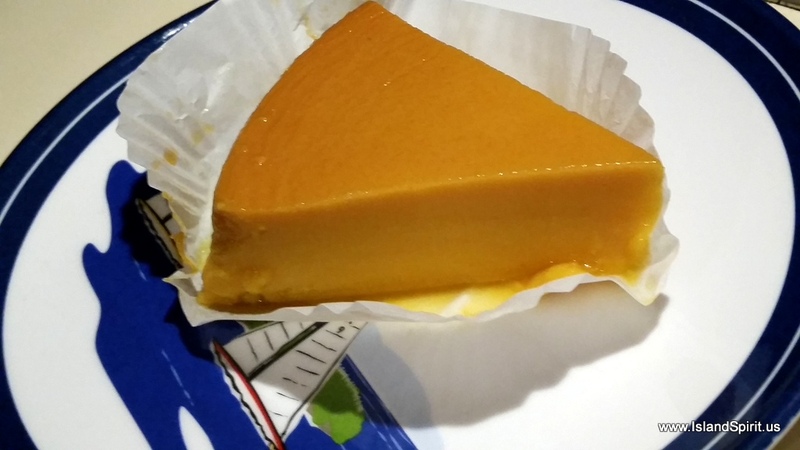 Flan for Radeen, WOW was that good! Here are the Charts showing the run from DR to PR directly without going into Luperon or Ocean World or any of the normal stops along the way. We were lucky to have the correct weather for this run and would do it again. 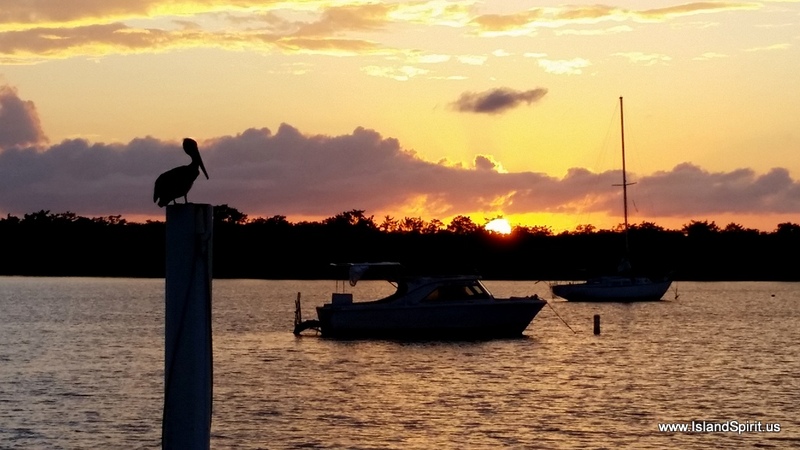 Here is our first sunset from Puerto Real harbour where pelican are plentiful and the harbor is calm and protected. 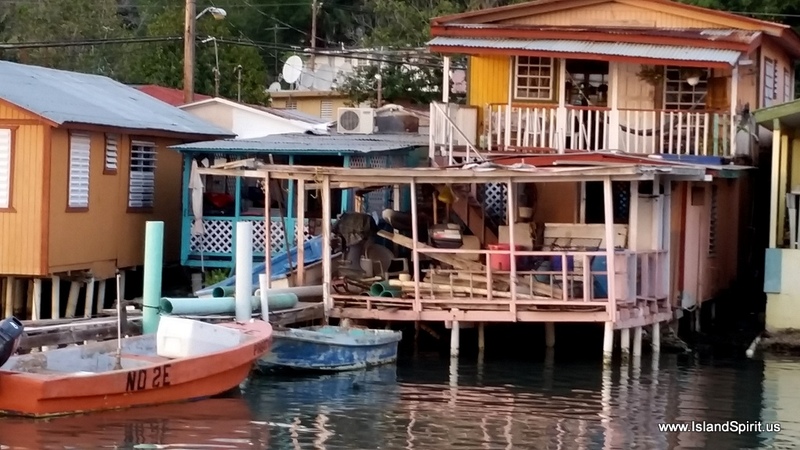 We think we will really enjoy exploring all the harbors and towns on the south side of Puerto Rico. 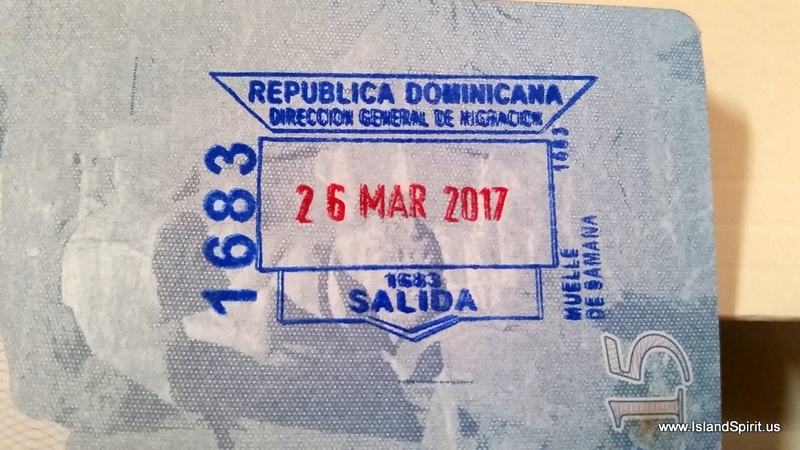 We are checked out of the Dominican Republic and we have our exit paper work called a “Despacho” which will allow us to legally leave the country. This all took about 4 hours with customs, marina office and the navy officer to check out our boat. 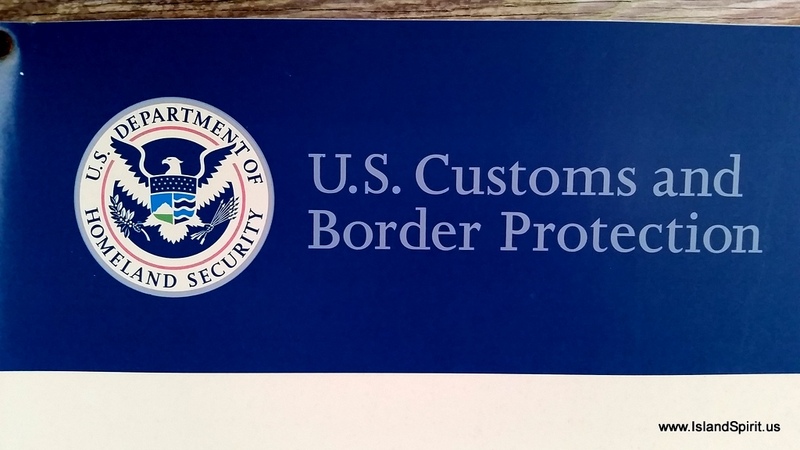 Once all was signed, stamped and approved, we were given the proper paperwork. Next task was predict wind app which we now spend an hour a day on as we study the winds and the swells. As it looks tonight at 1900 Sunday, with a planned departure at 0700 Monday, it all looks good to cross the Mona Passage. This is a 150 nm run all into the east and with the current storm up north of us, once again we have the winds pulled from east to southeast and then flipping to northwest. The storm has the ocean really kicked up into a 10 foot to 15 foot swell but that is north up in the Bahamas. For us the swell is predicted to be 5 feet out of the north east which will put the swell on our port beam. The winds are to be on our stern at 10 knots. We plan to check into Puerto Rico at Marina Pescaderia in the town of Port Real Tuesday at 1200-1400. Here are the captures of the predict wind app. This being our first crossing of the Mona Passage, of course we are looking at all data we can access. While here at the DR marina, we have had intermittent internet access making it difficult to get our weather information, let alone blog. We do feel that we have a good weather window to cross the Mona Passage, once again, a strong storm far away from us has pulled the trade winds south and then north and has given us a passage opportunity. Sometimes cruisers wait for weeks to cross this passage, we waited 4 days! 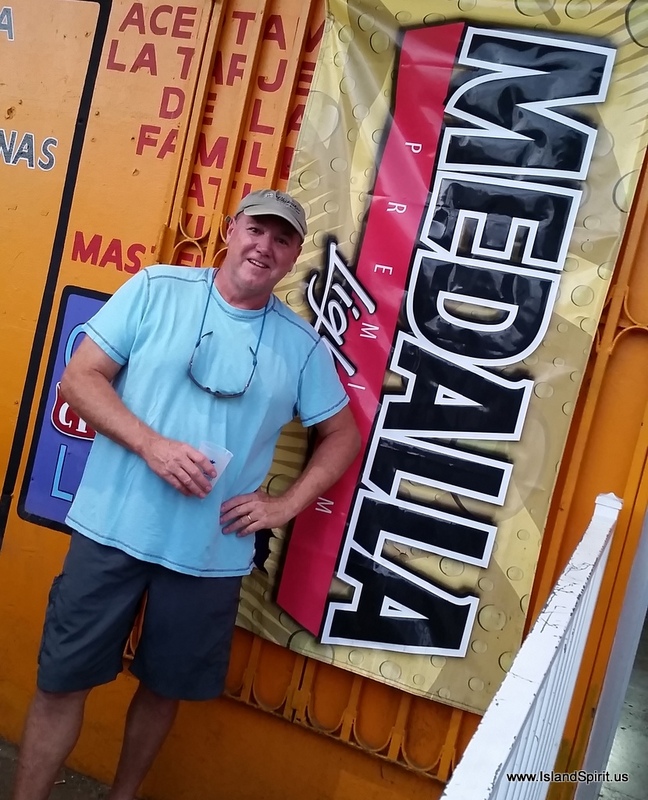 OK. We will see you in Puerto Rico…..
We rented a car for the six of us using Oliver at the marina excursion office and we received a mini van with a seriously cracked windshield and bald tires with a boom box and several amps. It also had a commercial taxi sign on the side door, so we could have offered rides as well. We are not sure where they got the car but no one asked questions. The rate was $90 US for the three couples to drive south to Santo Domingo to the colonial section of town. Meloney drove and did an unbelievable job weaving in and out of city traffic avoiding motorcylces, horses, broken down cars and trucks. We only were pulled over once for making a left turn like a pro at a 4 lane interesection where no lefts were allowed. She got out of the traffic ticket by showing Google Maps on the cell phone which had told her to make the turn. 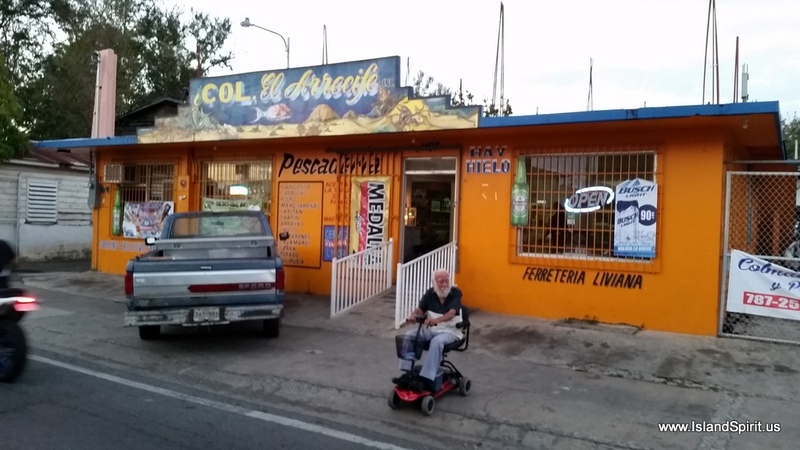 None of us could understand Spanish, he spoke no English, and so he shook his head and let us go with a stern look and a clear gesture to keep our eyes on the signs. Our first task leaving Samana was filling up the car which arrived on fumes. We stopped at the closet station 10 km away and we filled it up. That cost us $60 US and we ended up leaving about $20 of gas in the car at the end of the day. With wages averaging $10 per day here, this was a real win for the owner of this car. Notice the sign for the gas station prices. RD 210 per liter. The exchange rate is $1 to RD47. That works out to $4.46 per liter. One US gallon is 3.75 liters. So That means this is $4.46 x 3.75 equals $16.75 per US gallon! No wonder everyone is running around on small Honda Z3000 motorcycles. They must get 50-75 miles per gallon. The next challenge was driving 3 hours from Samana to Santo Domingo and then finding our way around town. We crossed rice fields, rolling hills with cattle, river valleys, rugged mountain passes and finally into the metropolis of town. Once in Santo Domingo, it was C R A Z Y….like driving in NYC. Cars cutting us off, multiple lanes of traffic, signs in Spanish, treacherous culverts on the sides of the streets, children sprinting across the divided highways, few traffic lights and “Una Via” streets everywhere. Thank goodness for Don’s LTE chip on T-Mobile, so he was able to navigate for race car driver Meloney as we quickly threw ourselves into the crazy flow. 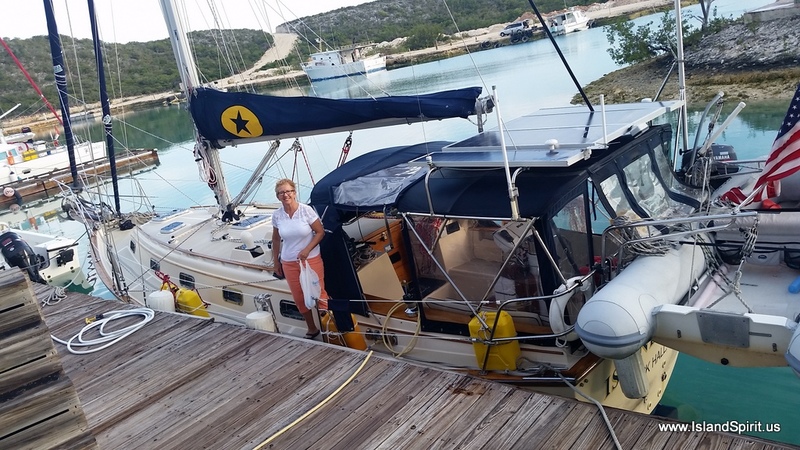 Once in the city, we stopped at a super market to secure funds from a Western Union where buddy boat Sea Star needed some serious cash to fix their bent prop and prop shaft damaged while we all crossed the Caicos Banks. They hit a coral head in the low angle morning light where none of us could see the massive coral heads as we powered at 6 knots into the sunrise. 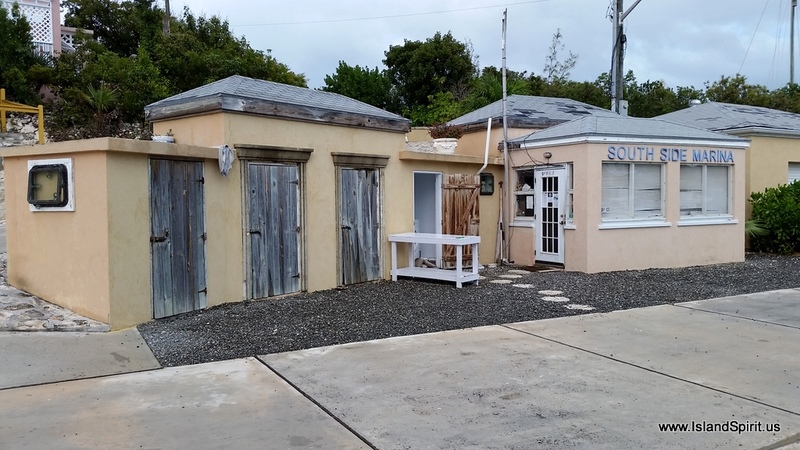 The Caicos banks are dangerous due to these large coral heads. You can not see them until it is nearly too late. Unfortunately, Sea Star caught one prop on the edge of coral and took damages. Lucky for them, here in the Dominican Republic, they hired divers to replace the shaft and prop while in the water! WOW, amazing workers like this are needed, since we have heard there are no haulouts anywhere in the DR.
After a quick stop at the very large store, we moved on to the colonial section of town. 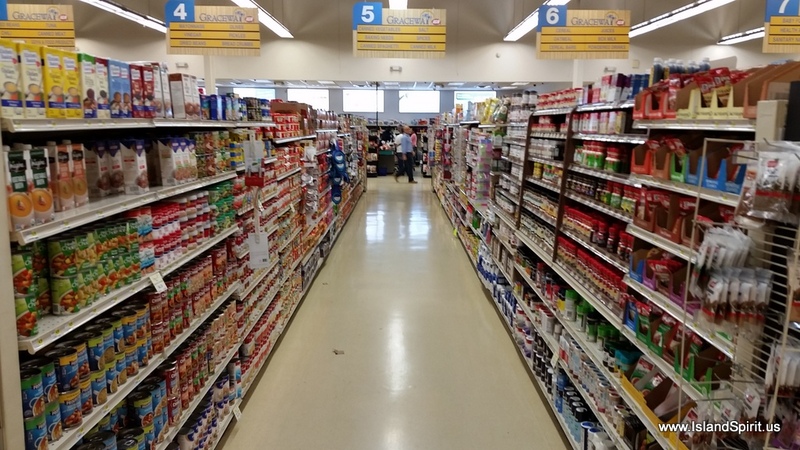 Here are some photos of the Carrefoure Store. It was a food store and a Walmart type store. Radeen and Meloney had a funny exchange with a young employee as they tried to find a small cooler. 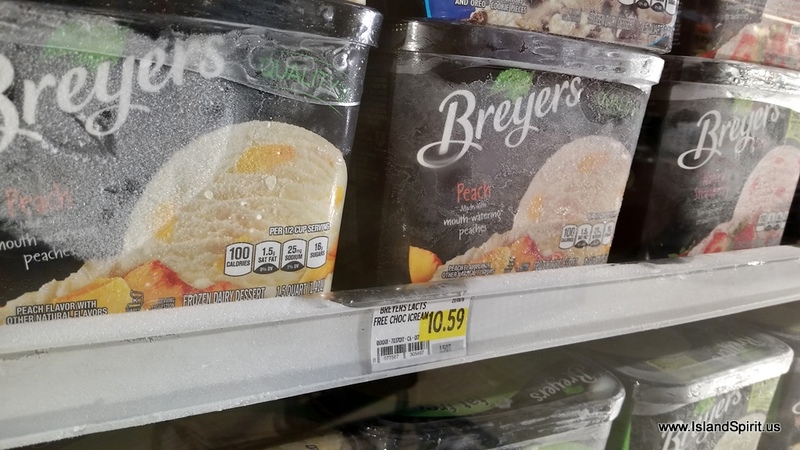 They pantomimed “cold” by shivering, then drew a box in the air and pretended to put something in it, while saying “leche.” He sent them to the aisle with jackets and sweaters! After wandering around, they found the coolers and brought one back so he could see it. They laughed together as he shook his head as if to say “Now I understand!” Part of the problem was probably the fact that milk here is all UHT milk in a box that does not need to be refrigerated until opened. 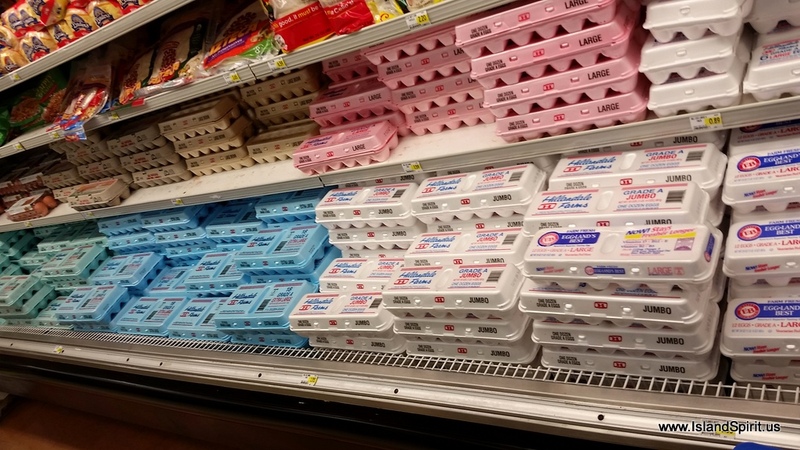 20 eggs shrink wrapped, unwashed and unrefrigerated. They will stay fresh for weeks. Driving into the colonial section of Santo Domingo, we enjoyed seeing the street vendors’ carts of coconut water drinks and fruit stands. The DR people are so hard working and everyone has a shop, a cart, a stand, or some crafts to sell. It is really a bustling city and it was very exciting. Especially when compared to the Bahamas or Exumas. We parked the car and walked into the colonial district where we bought a very valuable English audio tour of the Cathedral Primada de America Catholic Church, the first cathedral in the new world. Construction began with the consecration of the land in 1514. Over the next 200+ years, they continued to add twelve small chapels onto the sides of the main sanctuary. The church is in amazing shape and was very impressive. In the plaza outside the church is the monument of Christopher Columbus who sailed into Santo Domingo on December 5, 1492. 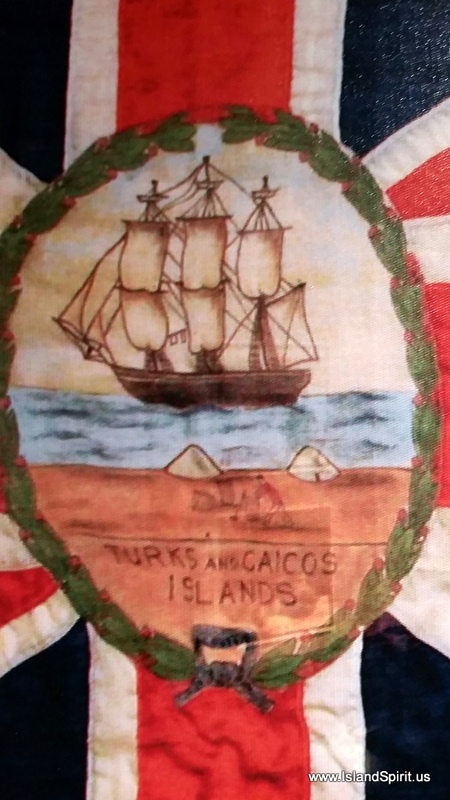 This is believed to be his third landfall in the New World after first landing at San Salvador in the Bahamas and next Rum Island/Long Island and then here. After our tours, we were guided to a lovely local restaurant named Mimosa by one of the government tourist guides who keep you safe from the locals who try to walk you out of the safe zone to shake you down. We all enjoyed a very fine lunch of various pasta meals and chicken dishes along with a dozen beers. The total bill for all 6 of us was 4,740 RD including tax and tip. This comes out to $108 US divided by 3 equaled $36 per couple! 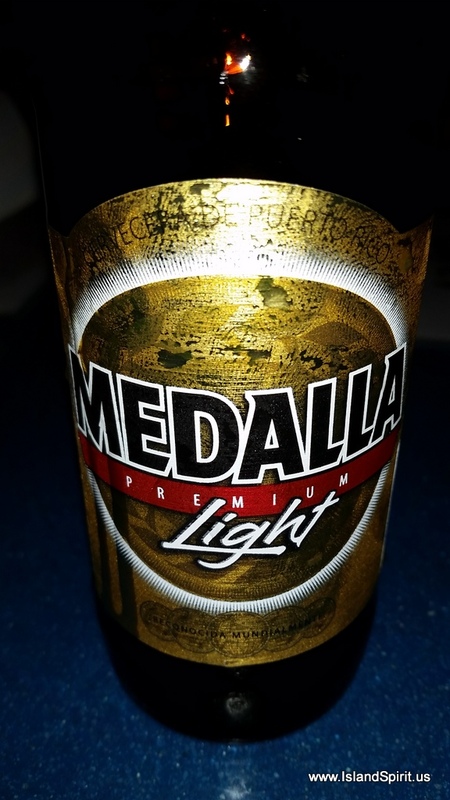 We are finding the local prices to be very reasonable and with the beer costing 100 RD or $2.12 apiece we can see why so many people vacation here. We bumped into this local arts celebration with a band and marching girls. They all looked so cute and happy and proud. After a full day in town, it was time to hit the road and drive the 3+ hours back to Samana where we arrived around 2030 hrs. What a fun day of touring the countryside of the Dominican Republic and the city of Santo Domingo. This country has so much to offer and it seems like the people are very hard working and proud of their country, as well as very friendly. 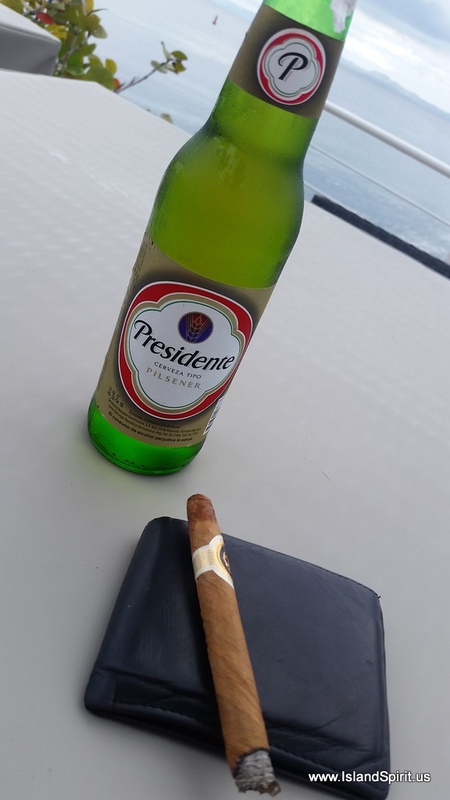 The DR is a must stop place on the sailing cruising tour. 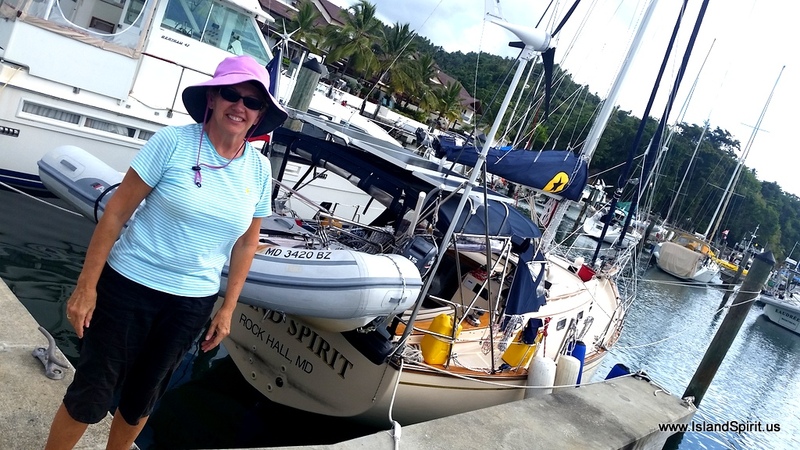 We made the 40 plus hour run (240 nm) from Provo, Turks and Caicos direct to the Dominican Republic where we docked at the beautiful Marina Puerto Bahia in Samana. This is a five star resort with multiple pools, cafes, comfortable lobbies and all for $1/foot which is only $35 a day. We plan to stay here 4-5 days until the next crossing opportunity for the 24 hour run across the Mona Passage to Puerto Rico. Being offshore for 2 nights and with only sleeping 2-3 hours at a time, we all were exhausted when we arrived Tuesday morning. After docking, we all crashed and then rallied for the pool happy hour where drinks are 2:1 at prices of $3 each. 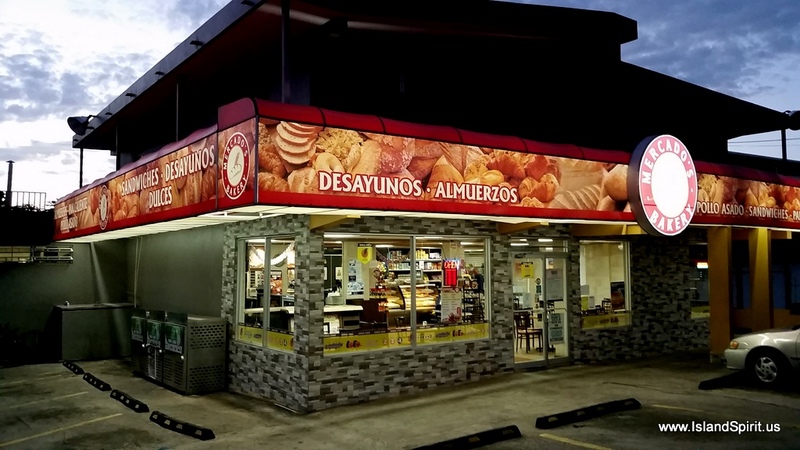 The DR peso is paying 47:1 USD. Yesterday I bought an ice cream bar for 80 cents! We already are concerned that it may be difficult to leave here. Then again, why leave? We have no schedule. Our passage was in calm seas and light winds of 5-8 knots out of the east, exactly as shown on our Predict Wind app. Our course was 140 degrees placing the wind about 50-60 off the port bow. This was a motor sail with a full main and a staysail with the engine on at 2400-2500 rpms. The boat runs 6 to 6.5 knots round the clock in this situation. Yes you make 150+ miles a day, but you also have to listen to the engine. The nice aspect is that we took no waves or spray over the bow. The sea had a gentle roll of 2-3 feet maybe 10 seconds and the winds never changed for over a day. Then on day two, as forecasted, the wind shifted in a matter of minutes and built to a solid 10-12 knots. It was at this time we finally killed the engine and sailed about 6 hours into sunset and on into the night until around midnight when we turned towards Samana. There we pulled into the harbor and dropped the hook and crashed. The next day we up anchored at 0630 to get out of the harbor and move around to the marina where we could check into the country properly. Checking in took about 1-2 hours with paperwork and boat inspections and re-tying the dock lines to keep the boat off the fixed concrete docks. 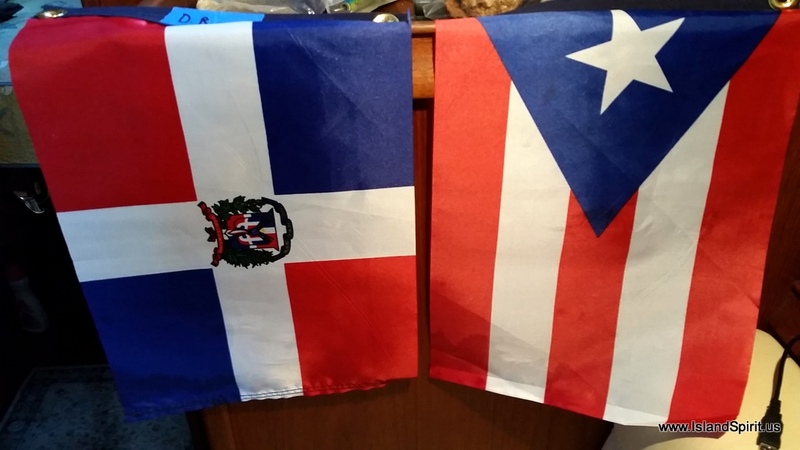 We were thrilled to lower the yellow Q flag and raise the DR flag. Right after that, we crashed at around noon. When we got up and walked off the boat, we all felt like we were drunk as we had not been on land for nearly 3 days. Our balance was whacked and we almost fell off the dock just trying to walk off the finger pier. 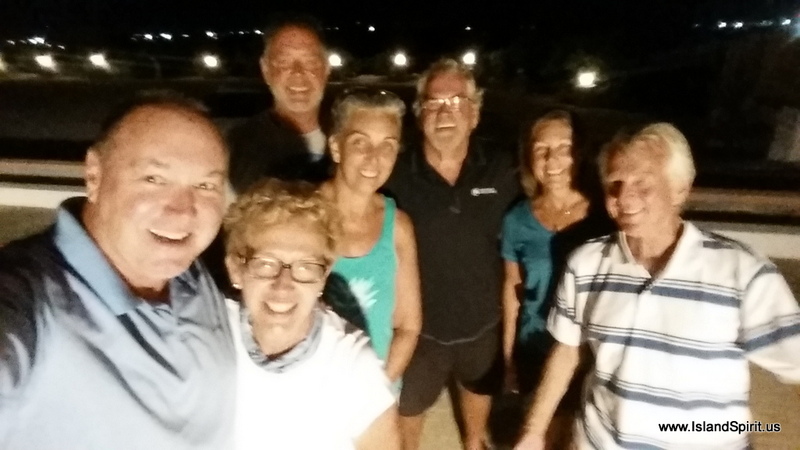 But a few happy hour drinks by the pool and some great times with out team of six made the evening a blast. This marina is part of a five star resort with a hotel and condos overlooking the harbor that sell for $300K to $500K. 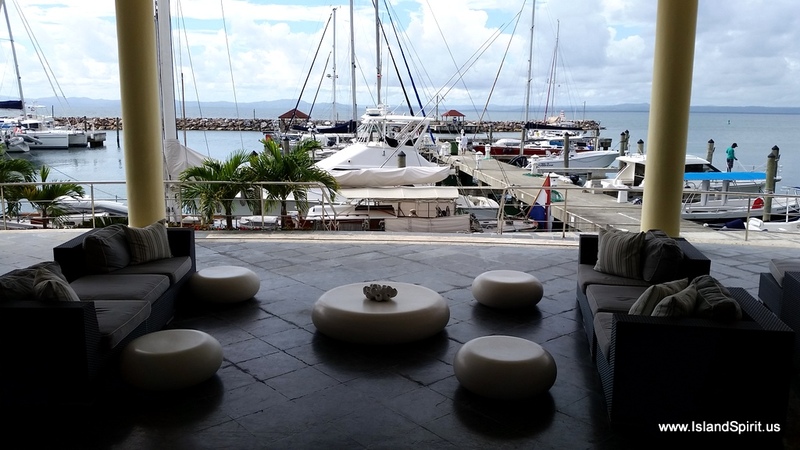 There are comfortable sofas and lounges over looking the marina docks. 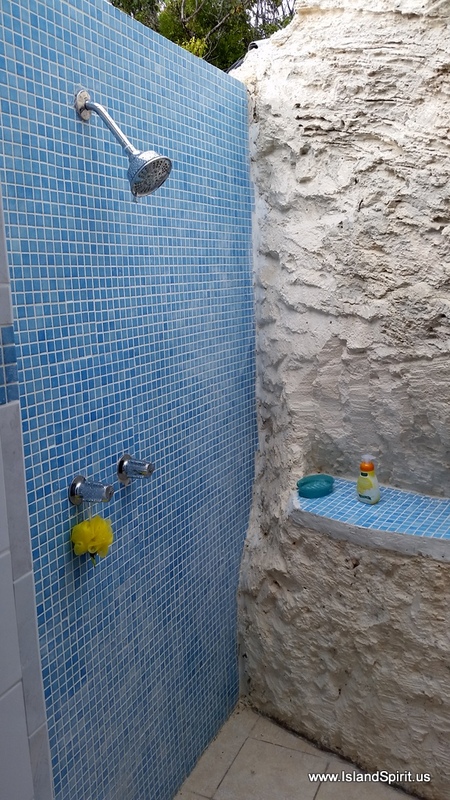 This is really an amazing place and at a fantastic price. 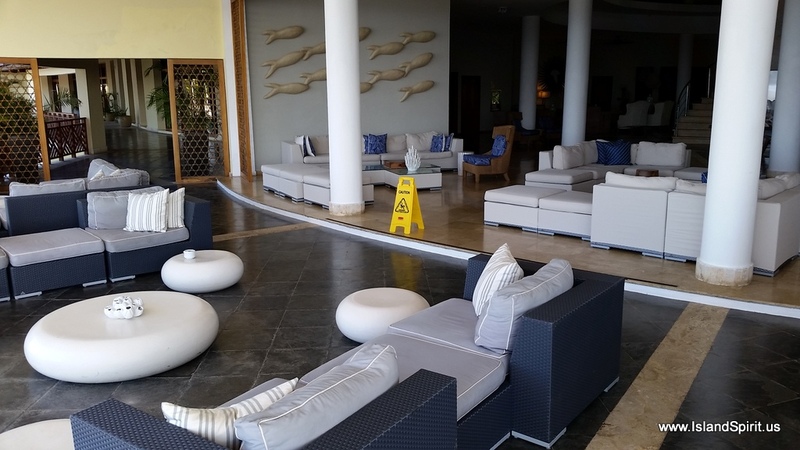 Look at this photo below, this is the lobby overlooking our dock. Beautiful setting! 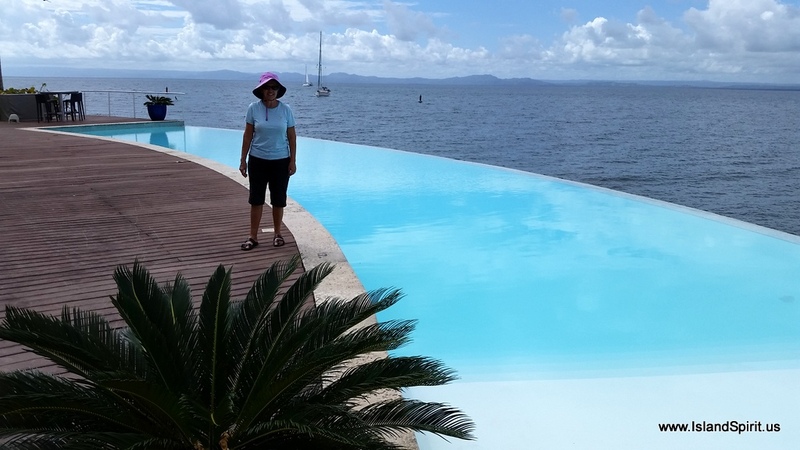 Then there is the infinity pool that curves gracefully at the water’s edge with a cafe and bar just off the pool deck. The staff is like any good all inclusive resort, very attentive and always there to offer you a drink and make you feel at home. 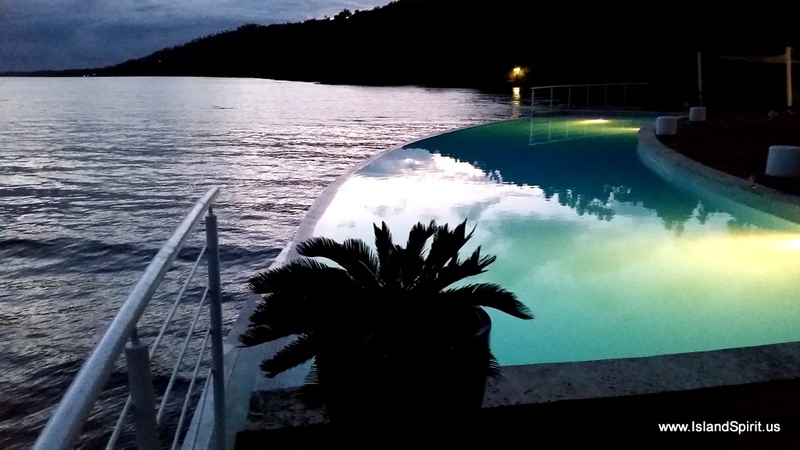 We are swimming in this pool every day, it is simply too beautiful. 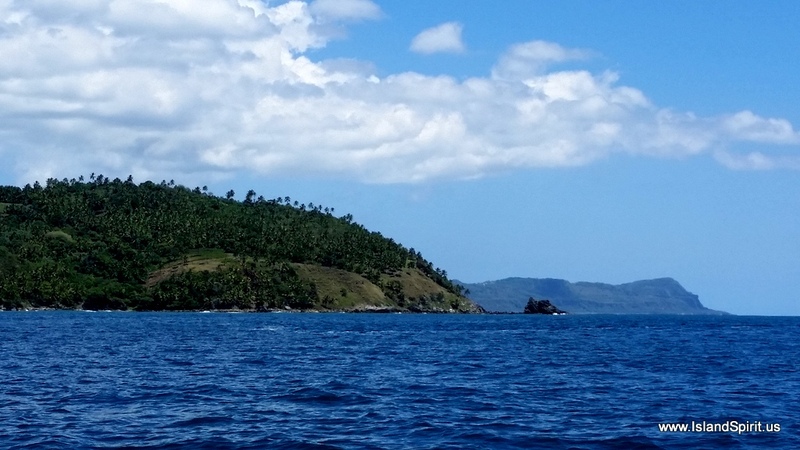 Our passage to the DR was so calm and so easy, we simply motor sailed 80% of the trip in 5-8 knots of east winds. Then on the second day the wind came up and shifted and we sailed nearly the rest of the way into the country. Look at this sunrise photo on the day we departed Turks and Caicos. One of the things we learned is that there are shallow banks that you need to pay attention to out here in the middle of the ocean. We are in thousands of feet of water and then there comes a sand bar island….oh….that is Big Sand Key. Well, who put that in our way? Go around that. Then south of that you have the Mouchoir Bank that rises up from 14,000 feet deeo up to 50 feet and yup, it has a ROCK that you can wreck you boat onto. So, find that and divert around that as well. Look at these chart images and you will see these features. Oh, look a ROCK on the Mouchoir bank! YIKES! When running at night, full speed ahead is always stressful and you really have to trust your radar system. That is why we think radar is number one at sea at night. It is the only tool that will tell you there is nothing in front of you that is solid, on the surface, that you could hit. So, you keep scanning, looking and you press on full speed into the blackness. This really takes some time to get comfortable with, but once you are, it actually is easier to be at sea at night that it is at day. There is simply nothing to see, so you just look at your radar screen. Here below is the view from the helm at night looking forward. Then the sun rises and all seems fresh and new again. Put on the coffee, make some breakfast, wake up and refresh, the day is starting and your ship is pressing onward. Day after day after day and you eventually reach the destination. This was our sunrise on day two. With all the motoring and the long distance, we decided to pour in three more jugs of fuel just to keep the tank more full than empty. Our tank’s motoring range is about 350 nm and this was only 250 nm so we were in no danger of running out. So, in this calm sea we easily could pour the fuel into the deck fill as there was no seawater running down the deck. Here is Hayden adding fuel. Finally, LAND HO….there were the Dominican Republic mountains under our jib as we sailed into the new winds that finally arrived. This was a sight we have never seen, tropical tall mountains under our own sails as we arrived from sea. We have sailed in Blue Hill Bay, Acadia Maine but even that does not look like this. This is tropical and it felt very cool. 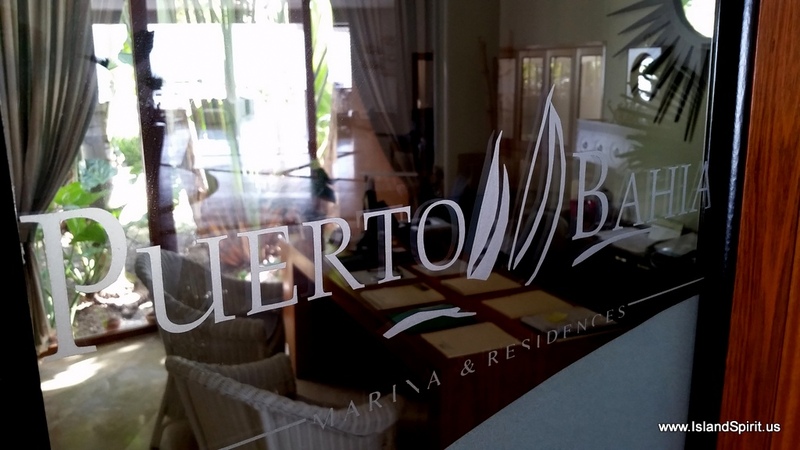 Welcome to the Dominican Republic and Puerto Bahia Marina….. Here are the buddies we are running with. Bill and Lauren on Grand Banks 42 long range cruiser SEA STAR and Don and Melanie on a Lagoon 38 Catamaran FEZYWIG. Very fun people! Tomorrow, we will tour the local town of Samana by local bus. The next day, we will drive a van 3 hours to the south shore to tour Santa Domingo, a UNESCO World Heritage Site. 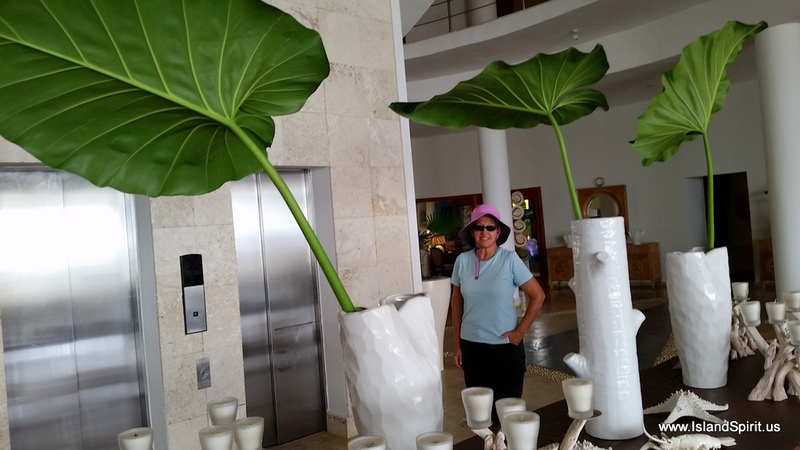 The Dominican Republic is a very interesting island to discover! 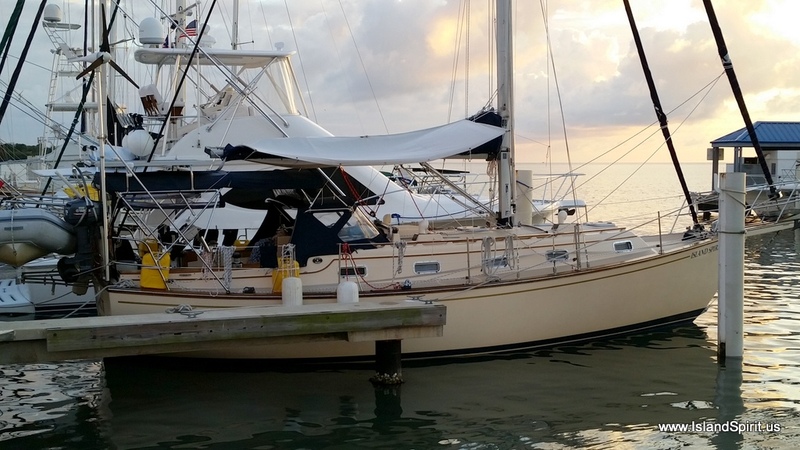 We are planning our next run from Provo, South Side Marina to Samana in the Dominican Republic. This trip is broken up into 3 main legs. 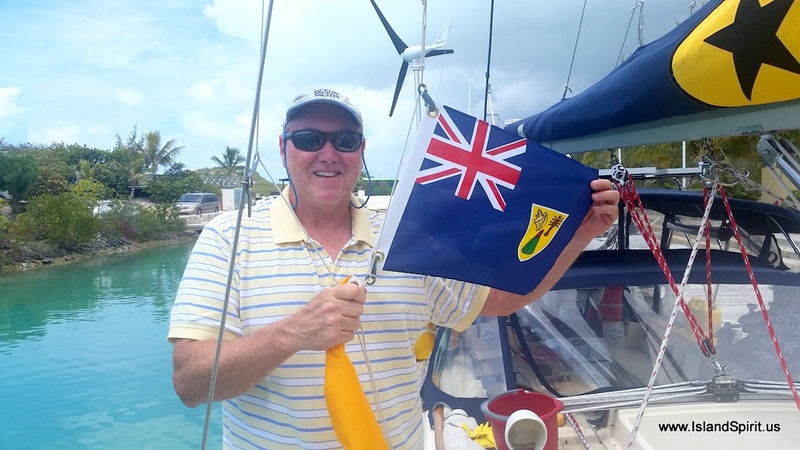 The first leg is 40 nm to run the Caicos Banks and get to sea. 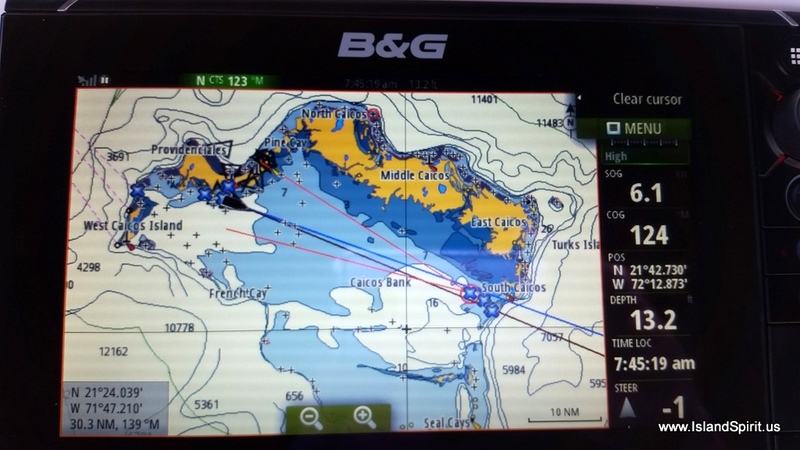 The second leg is 27 nm southeast towards Big Sand Cay where we may drop an anchor for a few hours to time our next leg. 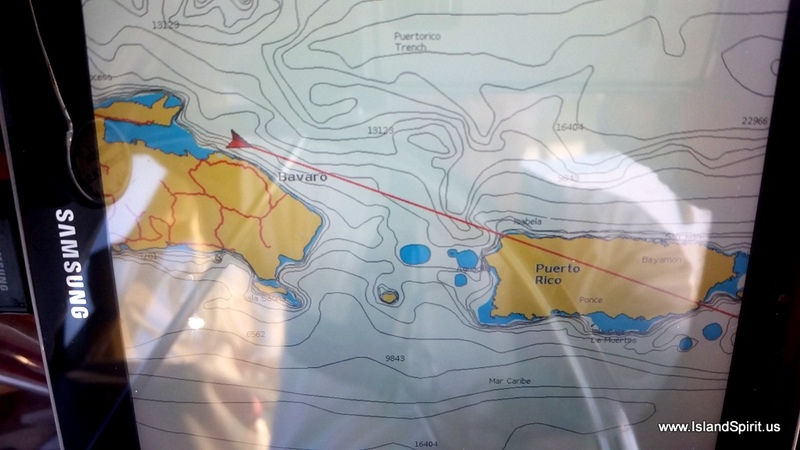 The third leg is a 180 nm leg to Samana, Dominican Republic. We have several back up plans to divert short of Samana to other harbors in the Dominican Republic such as Rio San Juan or Sousa or Ocean World, if necessary. We are fortunate to continue to travel with Meloney and Don from California, aboard a Lagoon 38 catamaran named “Fezywig” (a happy character in Dickens’ “A Christmas Carol”) and Bill and Lauren from Canada on a Grand Banks 42 trawler named “Sea Star.” Our boats are surprisingly similar in speed and depth. These lively and interesting new friends are a lot of fun. We are delighted to be able to plan our passages together. Many minds are better than one! As much as we are enjoying Provo and especially South Side Marina, we must leave! This is a very good weather window because the prevailing easterly trades have stalled. The winds are looking calm, 10-15 knots or possibly less. We most likely will need to motor sail to keep the speeds up to make the destination within the weather window. This often seems to be the issue. We wait for weather to be calm enough to go to sea, but then we are usually running before a front which pulls all the air into the approaching front and takes away the winds. Then the frontal system will arrive and we are trying to beat that arrival by getting to our destination before the front hits with squalls and much higher veering winds. It is really a speed, time and distance challenge. This trip is 247 nautical miles and, at 5.5 knots it will take 45 hours. Now we need to plan a stop into the trip to arrive DR in daylight (for visibility) and in the morning (for the lightest winds). We will use Big Sand Key as a stopping point to make the timing work out. 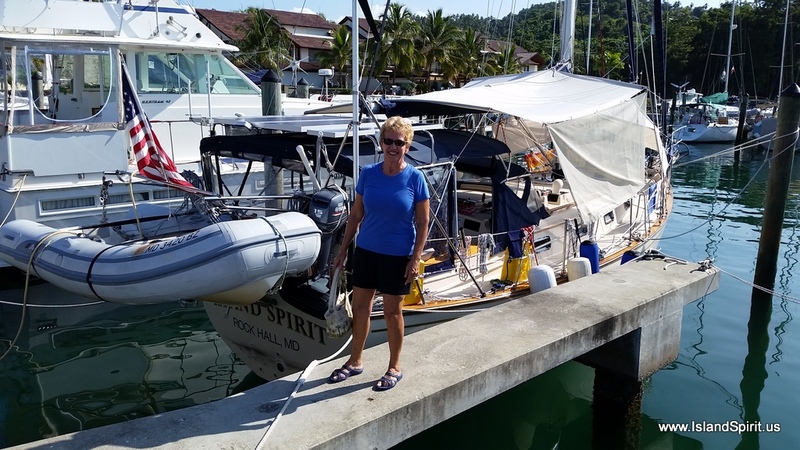 If all goes as planned, we will depart Sunday at 0700 and arrive Samana, Dominican Republic, Tuesday between 0800 – 1100. Here is the route on OpenCPN, showing our 5 legs and the mileage for each on Sun, Mon and Tues.
Blue shows our routes since November 2017 and red shows this next passage. Thank you for sailing along….. The approach to South Side Marina near Provo felt a bit scary in the morning light, knowing there were coral heads everywhere, but not being able to see them clearly due to cloudy conditions. Our four days here flew by, with boat jobs to complete and one great day of sightseeing and provisioning. This country is world famous for its underwater opportunities, so we were disappointed that we could not go snorkeling or diving due to the high winds, cloudy skies and storms which arrived the day after we did. Lucky for us, the dinghy was in the perfect location for repairing a small leak in the stern of her port tube. 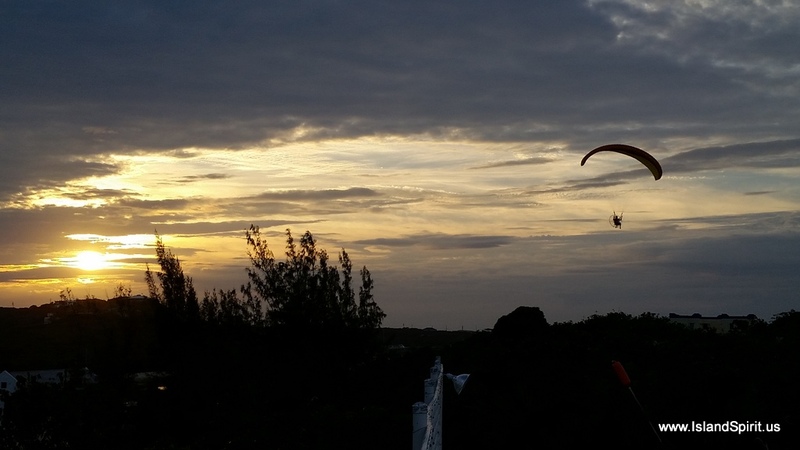 Sunset from Bob’s Bar, with a powered hang glider zooming over the marina. 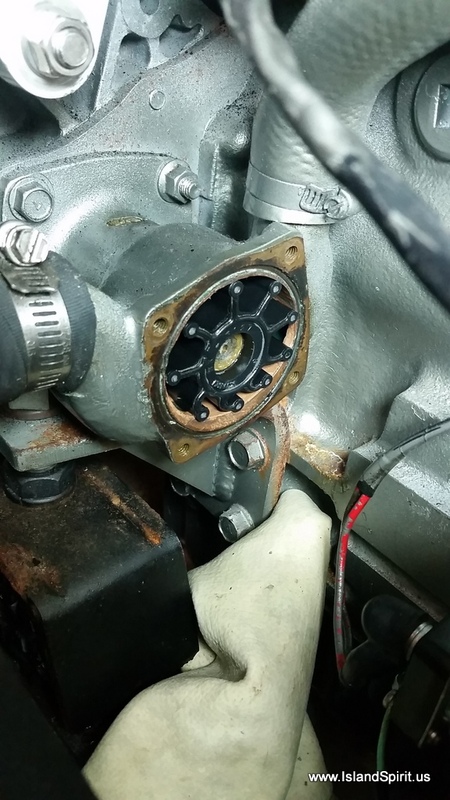 We replaced the impeller after Radeen-the-Diesel-Whisperer thought the engine sounded “hollow.” She has been right on two occasions in the past, with broken blades discovered upon inspection. Not this time, however. Ready for sightseeing in a rental van with 3 other boats. 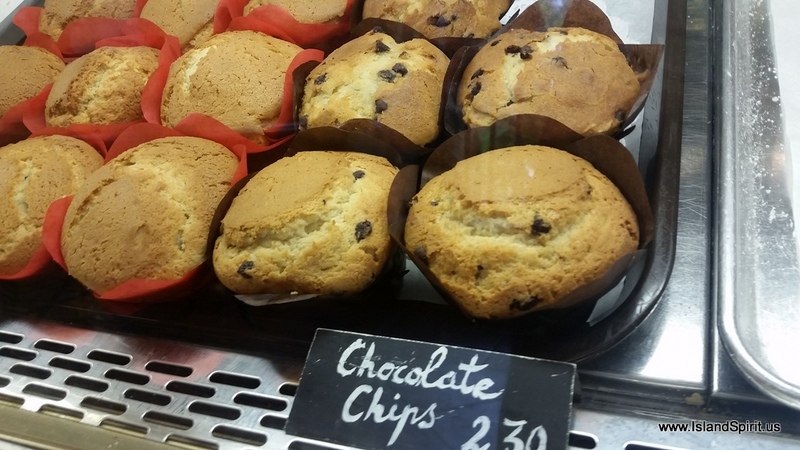 Our first stop of the day was at the Caicos Bakery for good coffee and delicious pastries made by French bakers. 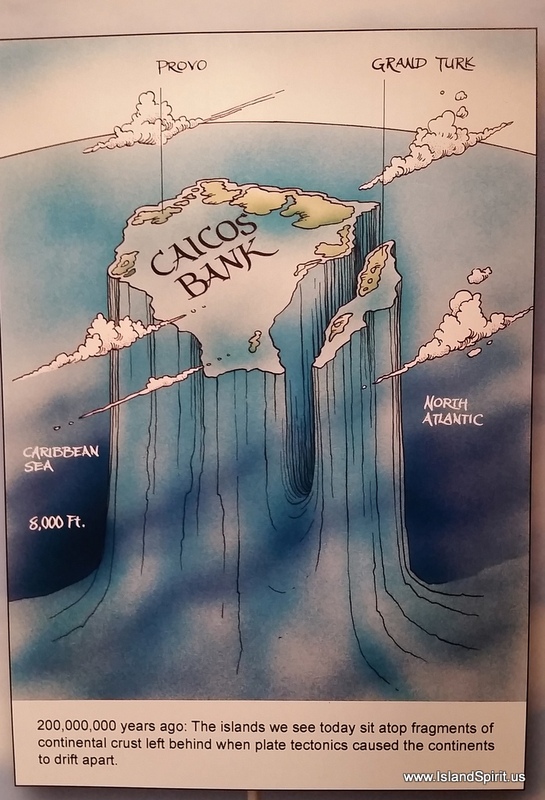 Remarkable topography 6,000 ft. from the ocean floor…The Caicos Bank is over 40 miles from east to west. Grand Turk is the larger of the islands across the Turks Passage to the east. 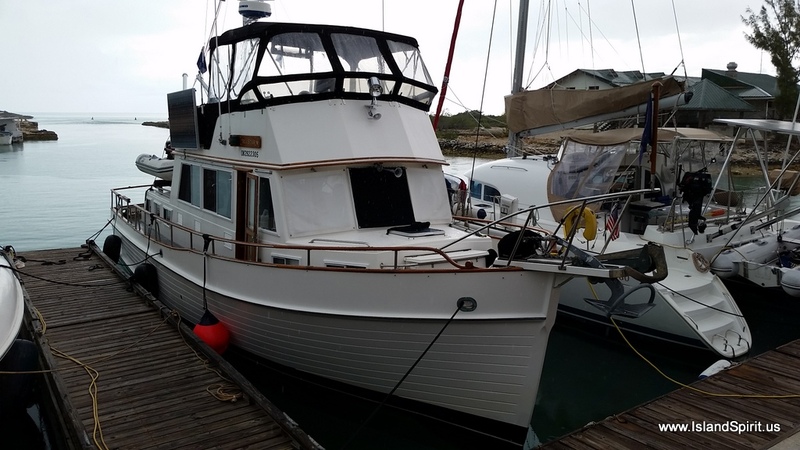 as it is onl yopen M- F from 9 a.m.to 1 p.m.
Grand Banks 42 Sea Star (Lauren and Bill) and Lagoon 38 Fezywig (Meloney and Don. Theresa entertained us with stories of history and culture. 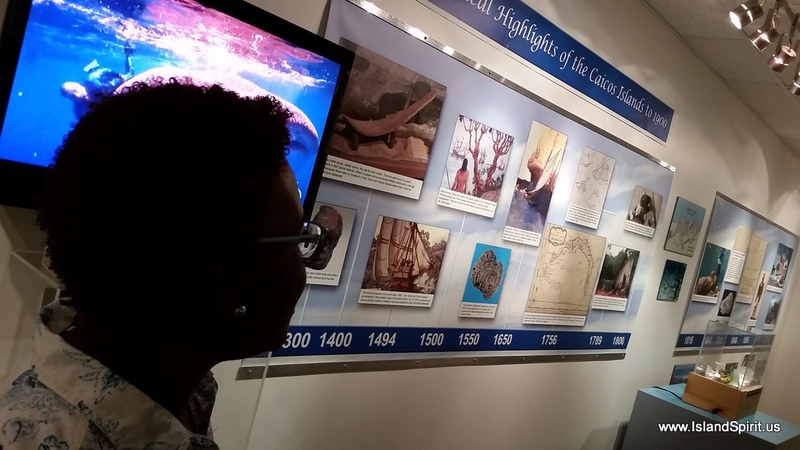 90% of the citizens are descended from the 192 people from the illegal slave ship Tourvedore which was shipwrecked trying to avoid British authorities. The captain and crew were arrested and the freed slaves were given apprenticeships for one year to learn how to harvest salt. We toured the inside of this traditional thatched hut and interesting gardens of medicinal herbs and barks. 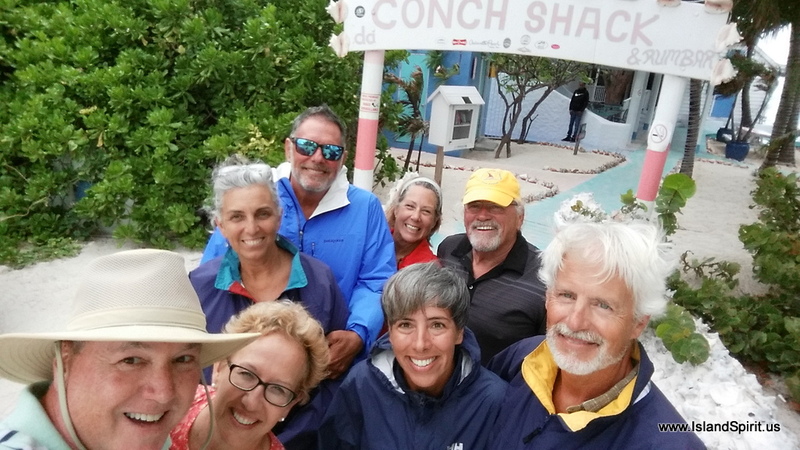 An adventure in dining al fresco in wind and rain on the north shore at the Conch Shack. We were speechless at this bounty, after 6 weeks of limited shopping in the Exumas. South Side Marina office and laundry room, with folding table. Floating docks and a beautifully maintained property. Bob’s Bar on the left and Bob’s house on the right. who made us feel so welcome in this beautiful place he started 40 years ago. Leaving Provo, heading ESE across the Banks. Good-bye to the Turks and Caicos! We have a good weather window again, so we planned our next leg of 240 miles with a 7 a.m. departure across the treacherous Caicos Banks. That means leaving the Banks by 4 p.m., passing Big Sand Cay by sunset and arriving in Samana, Dominican Republic, approximately 40 hours later. Thank you for following our adventure! 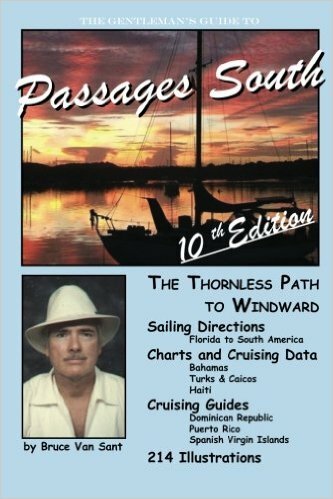 Radeen and I have studied Bruce Van Sant’s book “Passages South” and we have made the routes on our laptops and on our B and G plotter and Samsung tablet. 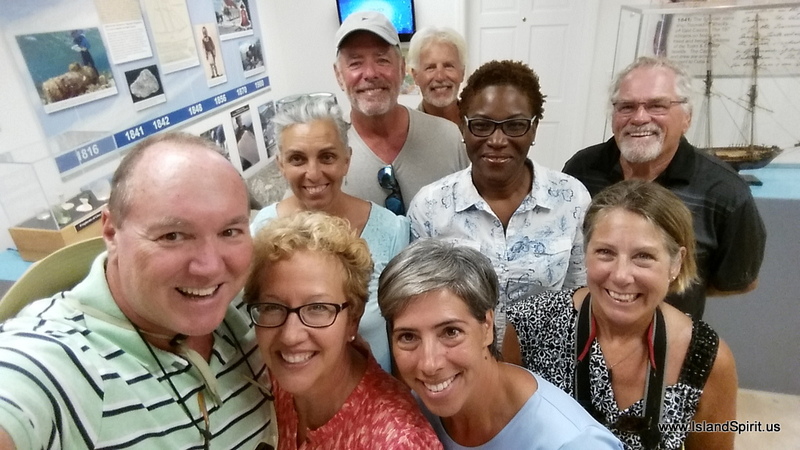 We are excited to begin this new chapter in our cruising adventures, which means heading south from George Town, Exuma, to the Eastern Caribbean. We have been to Long Island before and that will be our staging point. The route is well planned by Van Sant and the concept is like this. (He calls his route The Thornless Path to Windward, instead of The Thorny Path. Let’s hope so!) 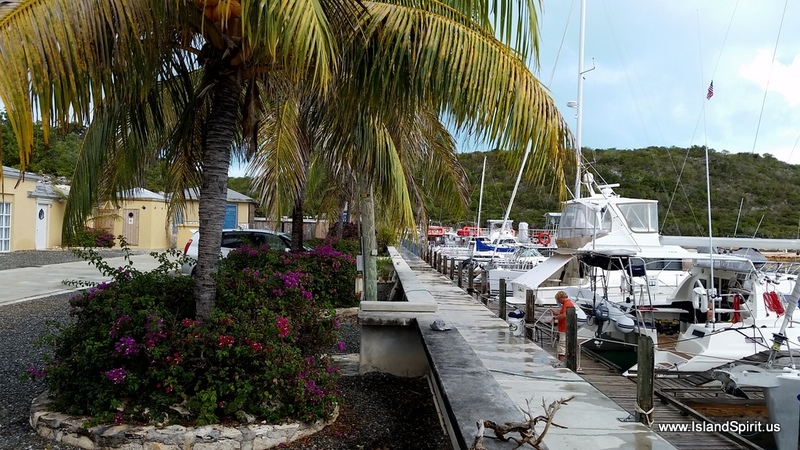 Leaving Long Island and heading east and south, we will make our first major stop at Provo in the Turks and Caicos where we plan to check into the country at South Side Marina. 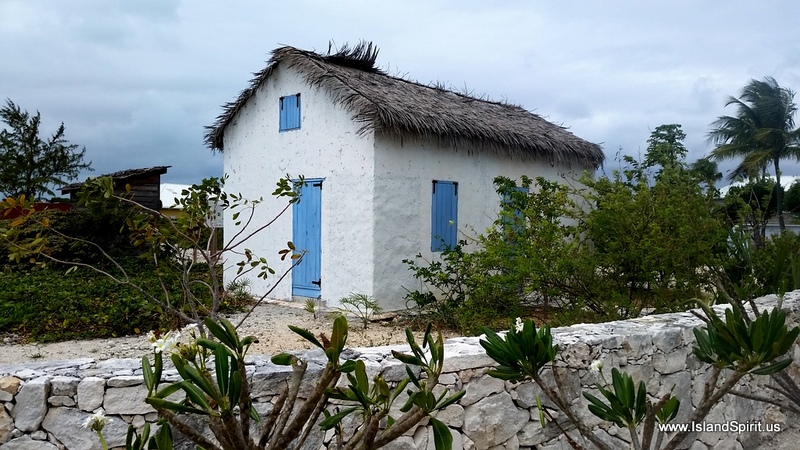 We will spend time in Provo and then wait for the next weather window to run the 50+ nm Caicos Banks. We will anchor for one night at the end of the Banks. 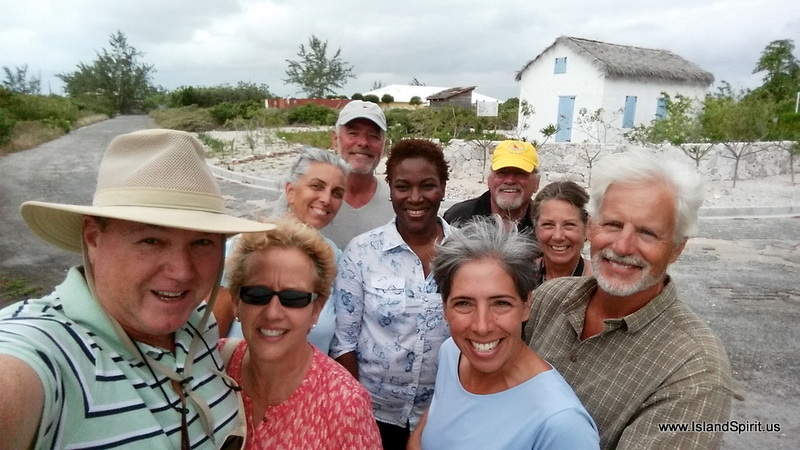 The next day we will run south to Big Sand Cay and then onto the Dominican Republic, known as the DR. Many cruisers sail into Luperon, Dominica Republic. This is actually where Bruce Van Sant is building a home and we would like to meet him. We also have heard that it is not a very clean harbor but it is very inexpensive with mooring balls costing $40/month! We prefer our own anchor to any mooring ball as we know the strength our gear whereas we would not know the condition of a mooring ball gear. The next option east is called OCEAN WORLD where we would need to take a dock. If you look at this map, you can figure out why they call this place “Motion World” as the east trades and swells come into this harbor as they bounce off the rock wall and reflect back into the marina. We also hear that is the swell is running then this can be a dangerous entrance. This is in contrast to Luperon where you can easily sail in and drop an anchor. We will need to study the swells before leaving Turks and Caicos and then make the call as to where to check in. 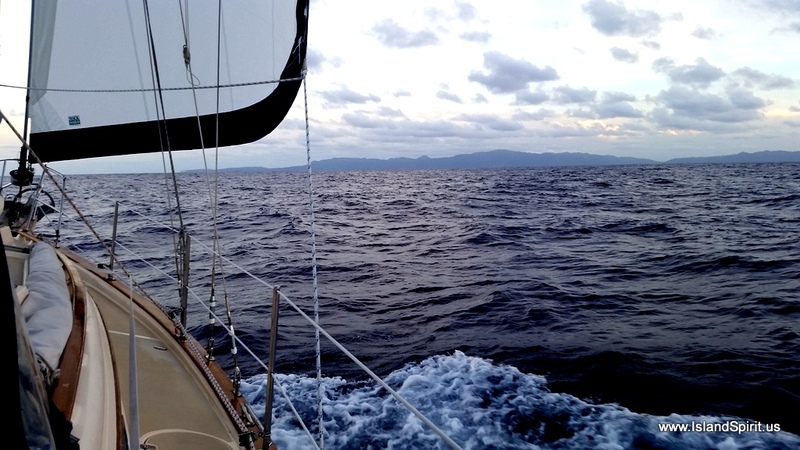 Now that we will be in the DR, the next challenge is motoring east into the trade winds and the current. This is accomplished by motoring at night when the trade winds are blocked by the mountain down drafts, called Katabatic winds, off the DR coast. This makes a calm lee that reaches offshore 5-10 miles off the coast. So, we will motor east during the night and then when the trades kick back in around 9am, we will head back into shore and drop the anchor and wait for the nighttime lee. This leads us to Puerto Rico’s south shore heading east to the Spanish Virgins and then into the US Virgin Islands and onward to the British Virgin Islands. 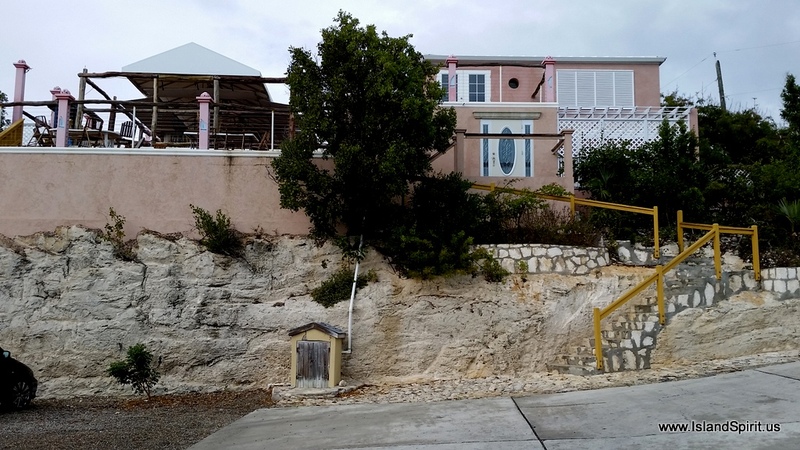 At this point, either this season or next, we will make a turn southward for St. Maarten and the Leeward Islands and then down the Windward Islands. 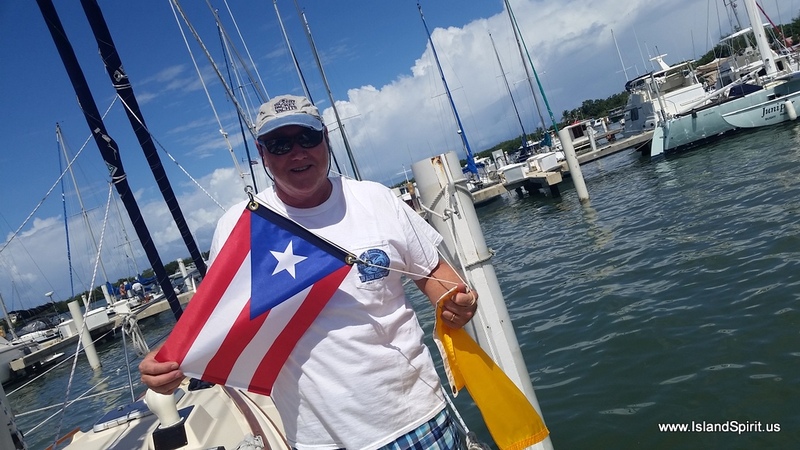 We will haul out the boat and store it somewhere between Puerto Rico and Grenada for May 15 – November 1. George Town to Long Island to Calabash Bay to Provo. Day hop to Conception (3) Rum (4) to Provo (5A) …. or make one 200nm run to Provo (5B). The Virgin Islands and south, island hopping or making a full 2 day run. Or, simply take a WX window and sail over night for Grenada and store the boat there. The overview map of this plan…. 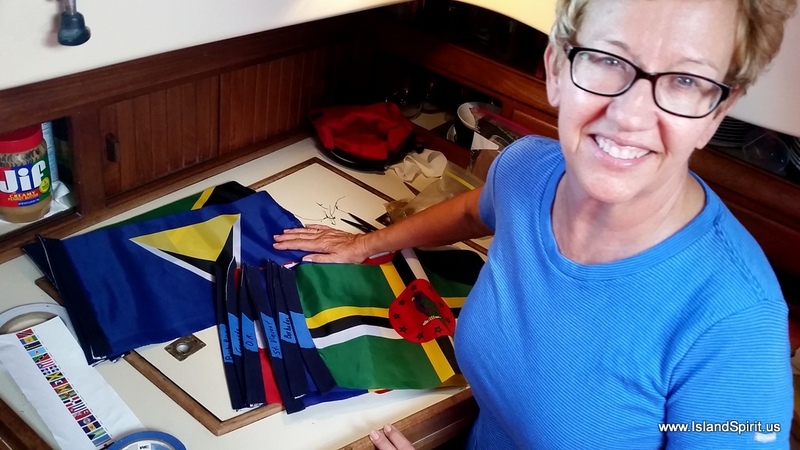 Radeen is one Happy Sailor Girl as we prepare our flags to sail to many new countries. 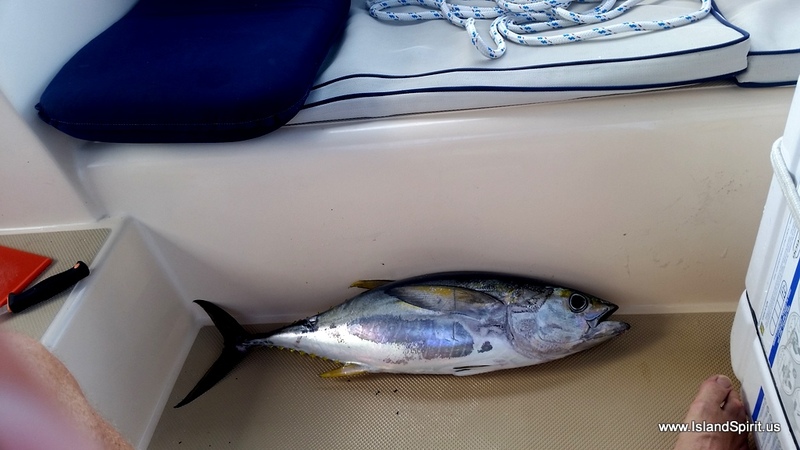 After 5 years of dragging lines behind the boat, we finally have caught a fish we can keep, a yellow fin tuna. Up till now, we only caught barracuda. 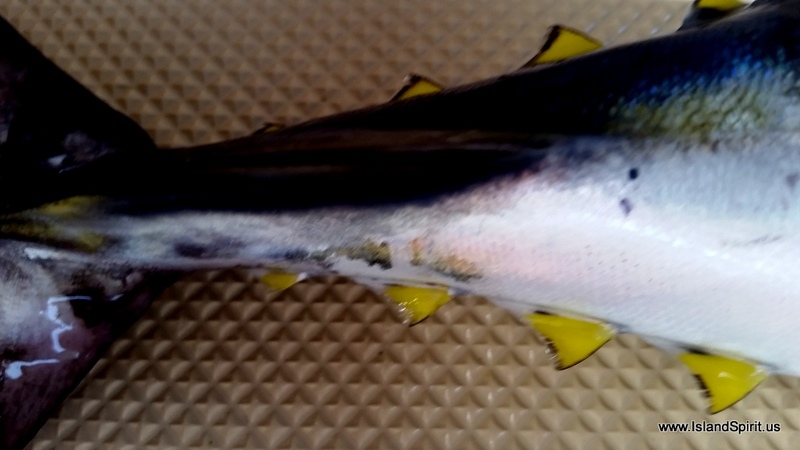 Now that streak has been broken and we have landed not one, but two yellow fin tuna on Island Spirit. Our second one was while under full sail in 15-20 knots beam reaching at 6-7 knots. 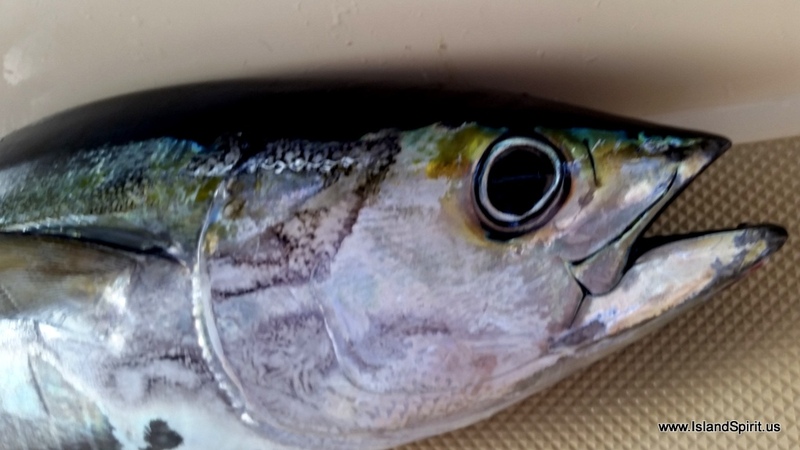 When this tuna hit, it ran out a lot of line until we could slow the boat by furling the jib and sheeting out the main, all while Radeen was holding onto the rod and reel and trying not to let it slip out of her grip. It was everything we could do to just hold onto the rod. Forget reeling it in until slowing the boat down. We were under full main and full jib doing 6-7 knots while dragging this 34″ tuna on the Penn rod and reel, line running out, and me adjusting the drag to slow it down. With the boat slowed to 2 knots and still under autopilot wind vane steering, I began to reel this fish to the boat. 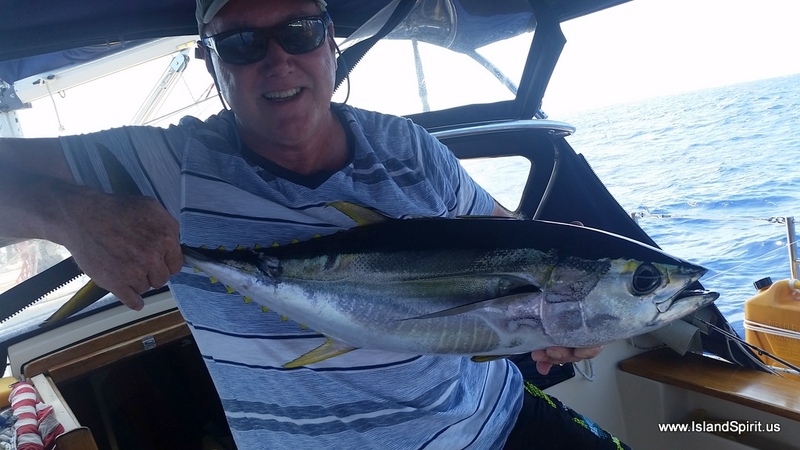 We were yelling ITS A YELLOW FIN TUNA, again, Yahooooo! Radeen handed me the gaffe, and with the leader in one hand I whacked it with the gaffe and some how I hooked it through the tail area! That was cool, so as I lifted the fish, I had a slip knot ready to lasso the tail like buddy John-Michael (J-M) on IP 420, PURA VIDA told me about. This worked out great because I could hold the fish up with the gaffe and the line to cut the gills and bleed out the fish rinsing it with saltwater rushing by. I could lower the head and gills into the water and then lift it out again. We also poured some old rum into the gills but that really seemed to not be needed. I will not be doing that again, as this JM trick was a great way to deal with all the blood. 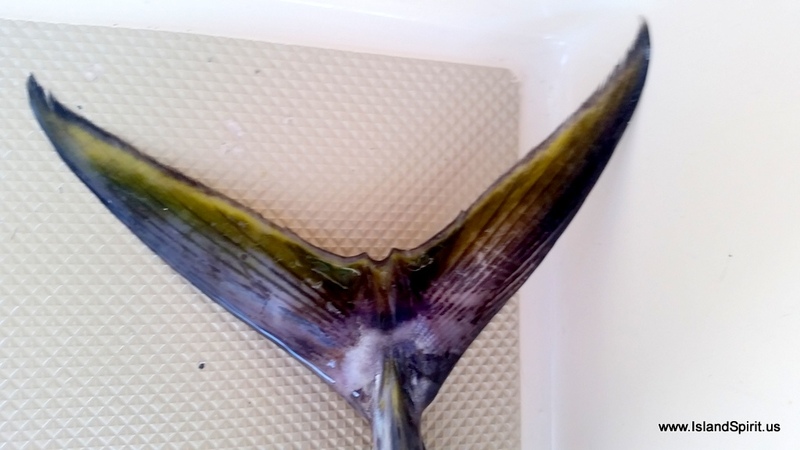 This fishing adventure was while under full main sail and full jib in 15-20 knots of beam winds. 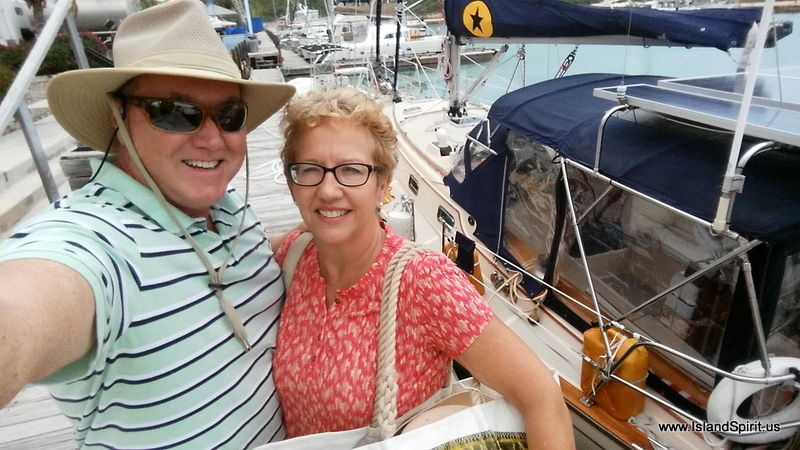 We were sailing from Cat Island back to George Town along with good friends Jim and Cynthia of NEVERLAND. We estimate the seas were running at 3-4 feet on the beam. The boat was rolling side to side and our bow wave ran from bow to the midship cleat like it does when pushing at hull speed of 7.2 knots. Sometimes we would be surfing down a wave and the boat would hit 8 knots. It was under these conditions that the reel sang out and the rod nearly went overboard. This landing went better than our last landing as we got lucky with the gaffe and we used the slip knot trick over the tail. Landing the fish is only half the challenge, the next challenge is butchering the fish while in these conditions. 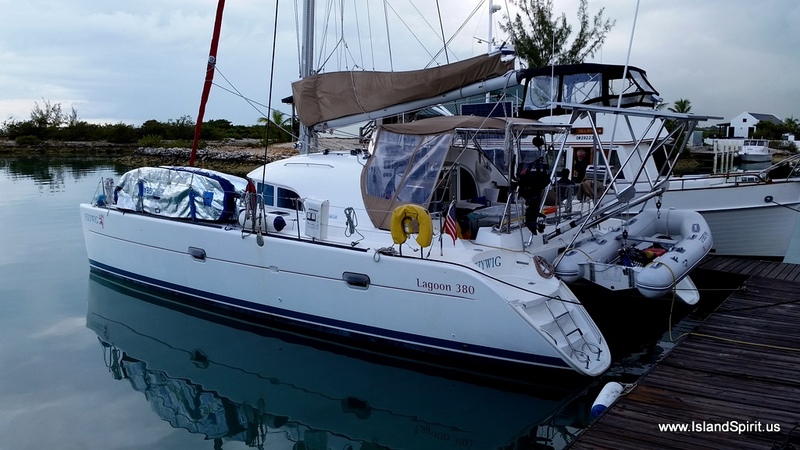 With the fish now dead and onboard, we returned to full sail and back to 6-7 knots of boat speed all the while rocking and rolling as we continued the remaining 10 nautical miles to George Town. 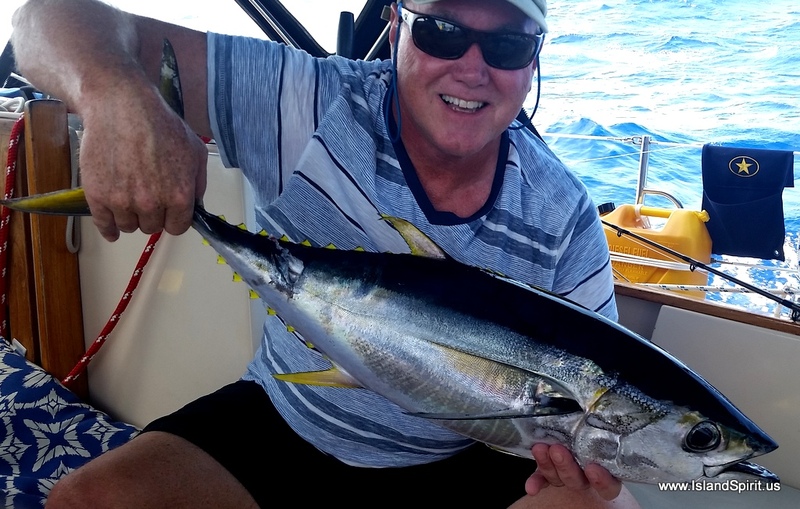 This gave us an hour plus to filet out this 34″ tuna. I am a rookie at all of this fish work and especially at the filet work. I try not to waste any fish although I see I am wasting a lot in the head of the fish. I need to work on that area. Once I have the filet off the fish, then I work on cleaning up the meat and removing the skin. I follow the Scott Bannerot book given to me by Chuck and Lynn of sv CYAN who sailed around the world. This book (The Cruisers Handbook of Fishing by Scott Bannerot ) covers every aspect of fishing for cruisers. Thank you, Chuck and Lynn, and thank you for the gear and your gaffe! With the filets dried off, we then packed them into ziplocks and moved them into the icebox ASAP for chilling down. 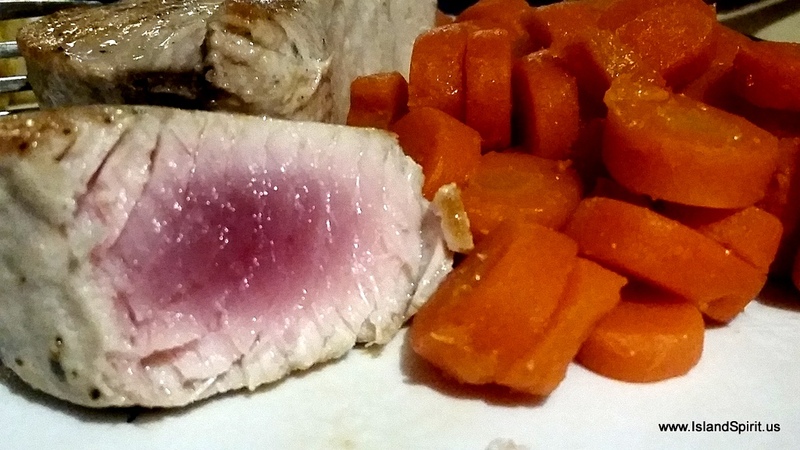 For dinner, it was seared tuna steaks. OMG, what a treat that is. We also share this bounty with others as it is really a lot of meals for two people. The last tuna served 14 meals, this one will serve about 20 meals. 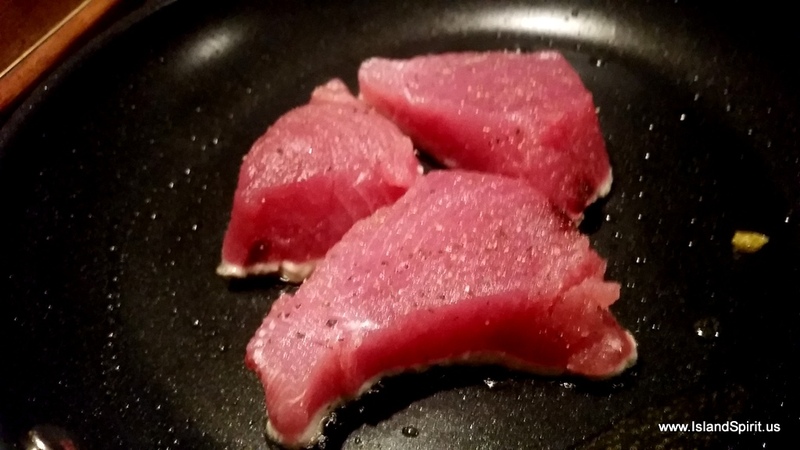 Tuna is my favorite fish, I am really glad we caught a yellow fin tuna again. 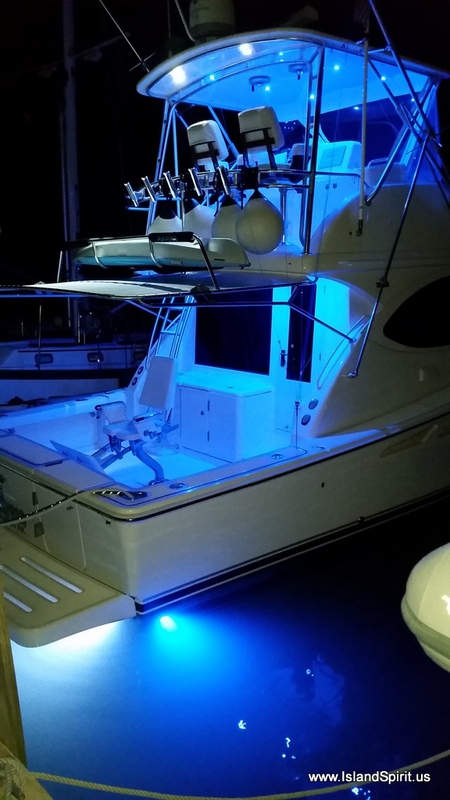 Next, we need to catch a Mahi Mahi…..
Teak work at sea, look, the blue tape is the color of the water! Yes, it really IS! 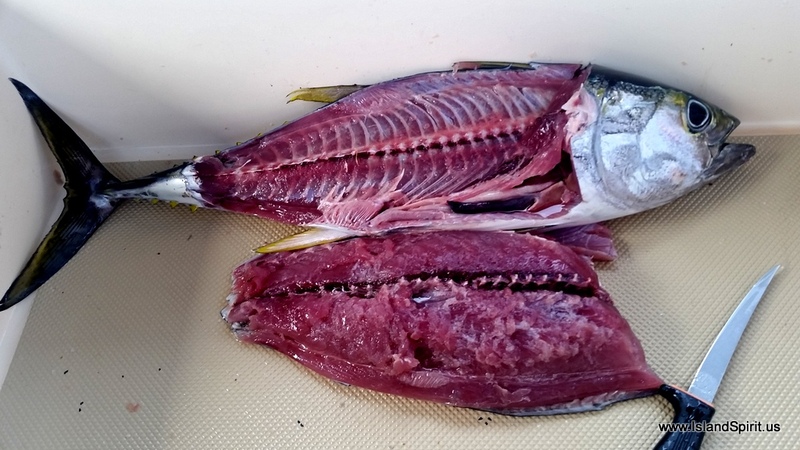 Is this not a crazy way to gaffe a tuna? I was going for the body and hit the tail, hey, it all worked out. We are learning…..
Crazy gaffe of the tail….oh well, it worked. Notice jib furling line slip knot around the tail. and to start our preparations for sailing to Long Island and beyond!